electronics accessoried organizer provides excellent flexibility to allow you maximizing its storage space. It can serve as a travel checklist. Before you leave a place, just open the case and check if everything is there, preventing you from leaving things behind. 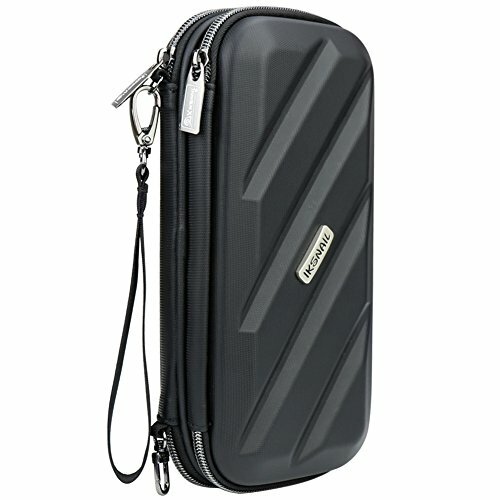 ✔ Make Life Easier : IKSNAIL electronics travel organizer bag is designed to keeps your essential gadgets in order and in reach without searching all over the place, which is a must-have for daily life /business trip / holidays / school / office, etc. ✔ Double Layers with Great Capacity : This gadget organizer pouch is Double Layer, including 1 large mesh pockets with elastic loops for phone / power bank / hard drive, etc; 4 small mesh pockets with elastic loops for USB cables / MP3 player / SD card; 5 elastic loops for small items such as usb cable / earphone / flash drive / sd card; 2 medium mesh pocket for phone charger / earphone / bank cards / wireless bluetooth headset. ✔ Environmental and High-end PU Leather Material: No peculiar smell; This electronics accessories organizer use premium leather, Interior offers secure storage space and protection against scratches, impacts, shocks, and splashes. ✔ One Piece Handle : Easy for you to carry. This storage bags helps you to sort and store your items because of the different compartments and pockets. Make your trip more enjoyable. ✔ Be Easily Strapped into Bag with Compact Design: The closure size of the bag is around 9.7"x 5" x 2.6", you can easily put it this cable organizer into your shoulder bag / laptop bag / backpack / luggage, etc. If you have any questions about this product by iksnail, contact us by completing and submitting the form below. If you are looking for a specif part number, please include it with your message.